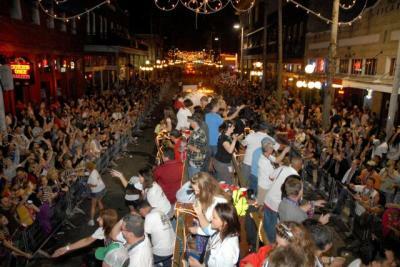 Honoring Tampa Bay area first responders, the Krewe of Sant’ Yago Knight Parade will close Ybor City’s 7th Avenue this Saturday, Feb. 8, with illuminated floats, marching bands and thousands of people. Pre-parade festivities include the chance to meet special guest and talk show legend Jerry Springer, along with a live broadcast from 102.5 The Bone’s radio personality Drew Garabo. Tampa Bay area first responders will be honored on the Grand Marshal float, along with representatives from the Gold Shield Foundation, which helps fallen heroes of Tampa Bay area families with financial assistance. This FREE event presented by MOR begins at 7 p.m., with pre-parade festivities starting at 4 p.m. in Centro Ybor. For the best view of the parade and 7th Avenue, tickets are available for purchase in reserved seating areas starting at $25. Visit www.KnightParade.com to purchase tickets or call The Italian Club at 813-248-3316.